April 17, 2018 (Lincolnshire, Ill.) – Knowing that one tool can make a difference in someone’s life, Klein Tools today announced its support of Project H.O.O.D., a nonprofit organization on the South Side of Chicago that provides training and employment opportunities to deserving members of the community. At a press conference held today at Project H.O.O.D, Klein Tools unveiled its “Pliers Promise” initiative, which equips 15 students in Project H.O.O.D.’s construction program with over $10,000 worth of Klein Tools. 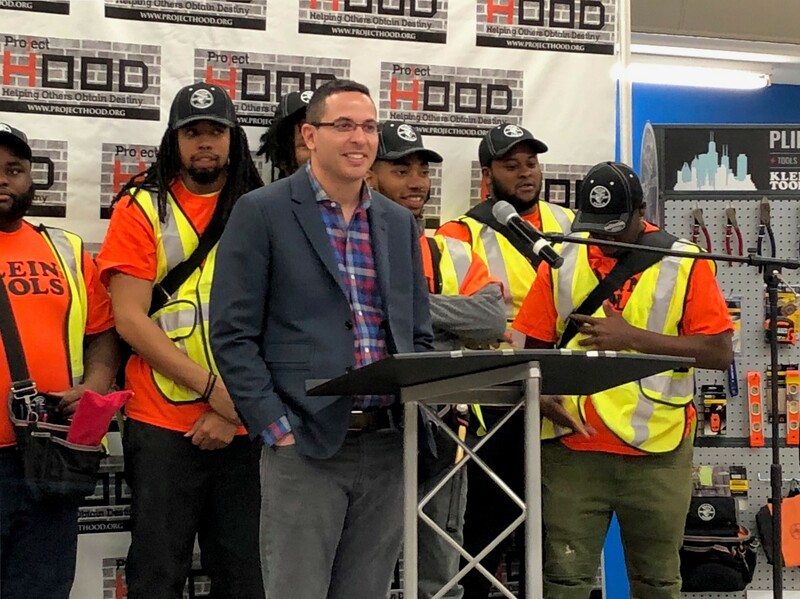 As part of the new partnership, Klein Tools will also offer scholarships to the top graduates within Project H.O.O.D.’s construction program so that they can successfully move to more advanced electrical training alongside students at Chicago’s HVAC Technical Institute. Representatives from Klein Tools and the HVAC Technical Institute present Project H.O.O.D. with two scholarships for advanced technical training. Project H.O.O.D.’s construction program trains men and women between the ages of 18-24 for a career in the trades. In partnership with the Illinois Chapter of Associated Builders and Contractors (ABC-IL), the 12-week construction program uses the organization’s nationally recognized training curriculum to teach students basic carpentry skills. Project H.O.O.D. also partners with the Preservation of Affordable Housing’s Woodlawn Resource Center (POAH) to provide employment coaching and financial services for each student. These partnerships help every student with placement into an apprenticeship program or an entry-level job after graduation. Project H.O.O.D.’s construction program also encourages students to explore different career paths within the construction industry in an effort to address the skills gap across all trade industries. 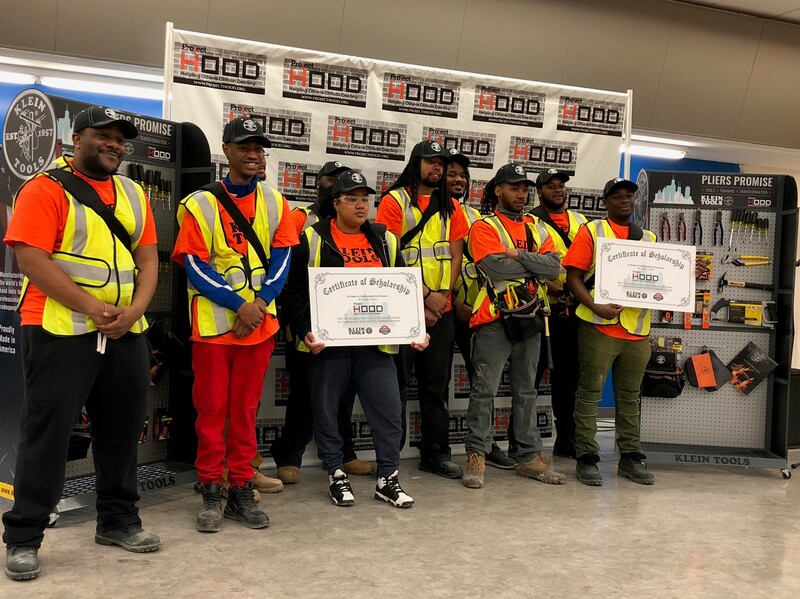 Upon completion of Project H.O.O.D.’s construction program, two students from each 2018 cohort will be recognized for their top-performance and awarded scholarships for advanced technical training at Chicago’s HVAC Technical Institute. HVAC Technical Institute recognizes the need for qualified technicians and provides the necessary skills and knowledge for career growth. Available courses specialize in both electrical and HVAC work, helping aspiring professionals be successful in the trades. Project H.O.O.D.’s construction program began in the summer of 2017 with its first cohort of students. In August 2017, six students, who Project H.O.O.D. specifically sought out due to traditional employment barriers, graduated from the program. All graduates have since received full-time careers in the trades with various Chicago organizations. 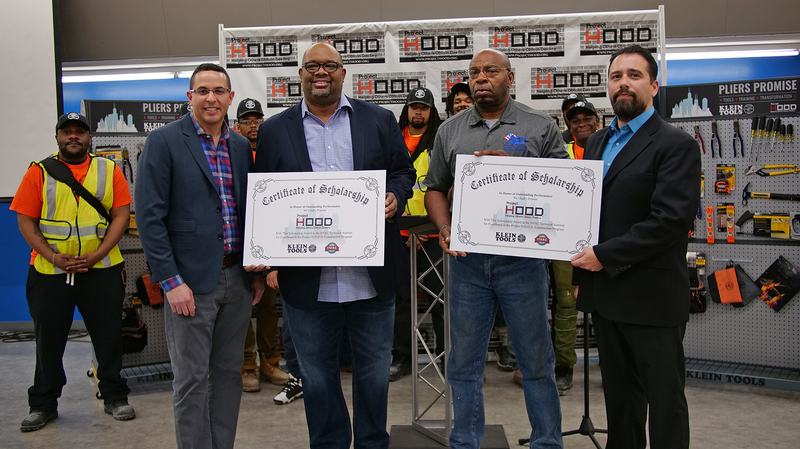 Because of the program’s success in addressing the skills gap and helping local Chicagoans find careers, Project H.O.O.D., Klein Tools and HVAC Technical Institute plan to partner for future cohorts in 2018. For more information on Klein Tools and the Pliers Promise initiative, visit our website at www.kleintools.com. Project H.O.O.D. is a nonprofit organization established in 2012 by Pastor Corey Brooks. Its mission is to empower people with the guidance, information and tools necessary to become peacemakers, problem-solvers, leaders and entrepreneurs in their communities. Project H.O.O.D.’s programming is designed to equip youth, adults, and families with the resources, skills, tools and experiences that are needed to be successful, healthy, and upwardly mobile members of society. For more information, visit www.projecthood.org. HVAC Technical Institute believes in the principle of complete preparation, providing not only the essential knowledge and skills but also the opportunity for personal and professional development. With a single goal in mind, HVAC Technical Institute prepares men and women to increase their worth in the heating, ventilation and air conditioning workplace, meeting the need for qualified service technicians and craftsman. For more information, visit www.hvac-tech.com.